If your not a fan of stuffing, this is the dish for you! Easy cheese and herb bread pudding is just what it sounds like – easy and cheesy, it’s a great side dish for the holidays! We are on the official countdown to my favorite holiday of the year – Thanksgiving with this Easy Cheese and Herb Bread Pudding. So, I thought I’d start things off by tackling the tough things first. 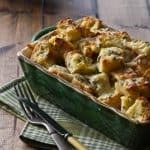 Stuffing, or in my case, this Easy Cheese and Herb Bread Pudding – but more on that in a minute! I know, it’s a pretty controversial topic – cooked in or out of the bird? Packaged mix or homemade – Grandma’s standard recipe or something new? In my family, the answer to that question was always easy. We did not have stuffing. Since my grandparents were immigrants, Thanksgiving was a new holiday for them and although my Gran happily made a turkey with gravy, cranberry sauce and potatoes, she was NOT going to make stuffing.. or a pumpkin pie for that matter.. So, for me, stuffing was never an issue – until I was in college – and had stuffing for the first time. It was not a memorable occasion. In all honesty, I couldn’t see the appeal – salty, mushy and grayish brown in color I honestly couldn’t understand why someone would allot valuable stomach room to it. But as the the years passed I had different versions – some made with bread, and some made with rice and all sorts of delicious ingredients. Now this was something I could definitely devote some tummy space too! Looking for even more ways to make Thanksgiving easier? Check out my Ten Tips for Surviving Thanksgiving! Easy cheese and herb bread pudding is just what it sounds like - easy and cheesy, it's a great side dish for the holidays! In a small saute pan melt the butter over medium heat. Cook the shallots until they are soft and translucent. Add the wine and simmer for 3 - 5 minutes until wine is reduced to approximately 2 Tbsp. Set aside. In a large bowl, whisk the eggs, half and half, salt and pepper together. Add the herbs and the shallot/wine mixture. Stir to combine. Stir in the cheese. Fold in the bread cubes. Let sit for an hour (or refrigerate overnight in the refrigerator). Pre heat the oven to 350 degrees. Pour the mixture into a greased 9 x 13 inch casserole. Bake the bread pudding for 40 minutes until the pudding is golden and puffed, about 40 minutes. Cool 10 minutes and serve. I have been dying to try one of these for a while now. I bet I can get my picky eater to try this. Cream! Cheese! Bread! What a gorgeous savory bread pudding! I see so many recipes on a daily basis and many are very good. But few really excite me. This one does. I can hardly wait to recreate this in my own kitchen. Bravo! I am so with you on the stuffing history. It always tasted exactly the same and has way too much sage. Which I now love but that’s because I have my own plant and fresh is so amazing compared to dried sage. I try to make a new one each year but I have to admit; and this will come as no surprise to you at all…the one with pumpernickel bread and bourbon; well that one has been a keeper. I agree with Lana…this is so unique and I’m dying to try it! I really love this beautiful, flavorful alternative to stuffing! I’ve had good stuffing, bland stuffing and fabulous stuffing, but I think this bread pudding outdoes them all. I’ll try this even without the turkey (we don’t do Thanksgiving here). Perfect! Amazing! This is a fabulous recipe Nancy!! Love it. I personally love stuffing, my mom’s is legendary in our family, but I am always up for alternatives, and this would also make a wonderful Christmas side to a prime rib or roast duck or goose. I am so saving this for then!! Nancy — We also make bread pudding instead of stuffing because it’s also doubles as a satisfying main for the vegetarians at the table. This one sounds fabulous! Well…I have to say that for me, the dressing (or stuffing) is the best part of a Thanksgiving meal. 🙂 I’m sorry your experience with it is salty, mushy and brown. I need to make you a good dressing! 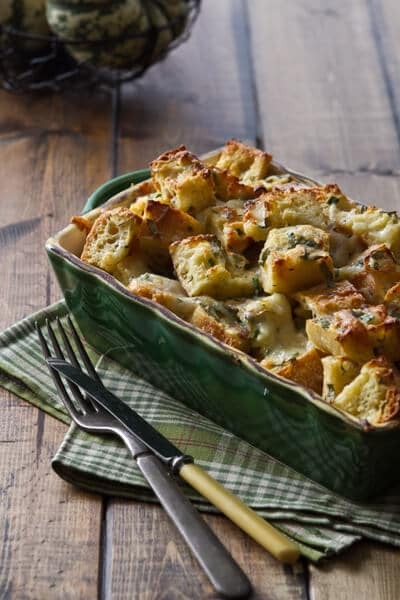 With that said – your herb bread pudding looks fabulous! Looks like a great dish for between the two up and coming holidays! Beautiful dish. Thanks MJ!! I definitely think I did not get the proper introduction to stuffing! Nancy, this definitely looks like it’s worth reserving some of that precious stomach space for. I love the rustic look of this with the big hunks of bread. It would make a great addition to any Thanksgiving table. I have to say it definitely is worth the tummy room!!! I don’t really understand the appeal of stuffing, give me a good bread pudding like this over it any day! Beautiful bread pudding for the holidays luv! did you say cheese, bread, and pudding all in the same sentence? I would eat this all year round and I would covet the whole tray! Me too Susan – it is total comfort food! I love this version of stuffing. I can imagine how moist and flavorful it is! Srsly loving all these flavors. Shallots, chives all these flavorful cheeses. Just comforting holiday delicious! I totally agree with Georgia!!! So many people love stuffing more than the turkey – with all these stuffing recipes, I am going to have to try it!! this is really calling my name! It’s looks so wonderful. Comfort food at it’s best!!! Thanks Diane – it definitely qualifies as comfort food!! This looks and sounds absolutely delicious! Perfect for Thanksgiving, but I have a feeling I will be making this all fall and winter 🙂 I love your blog! Aww… thank you so much – you totally made my day!! After making this, my son informed me that he is definitely ready for another batch… ah to be a teenager!!! How perfect for Thanksgiving! Thank you for sharing this recipe! Hi Jen!! Thank you for stopping by the Table! This is my kind of “stuffing”. I didn’t grow up with stuffing at Thanksgiving either, so I could definitely try this for something different. Hi Jana! This goes really well with roasted poultry or pork! I love that I can make it a day ahead and then just pop it into the oven – hope you enjoy it!! It definitely can replace the stuffing – it is definitely one of our new favorites! My that looks fabulous! I always heard my Grandmom spwak of Bread Pudding but she never made it for us. She was born in 1901. Definitely going to try your version! Pinning! I think I would skip the turkey to make tummy room for this! Thanks for stopping by the Table! So glad you like the soup! Much better than any stuffing I have seen…wow, just look at all that wonderful cheese! So delicious! Thank you!! I hope you and yours have a fabulous Thanksgiving as well!! Great recipe, but quick question. Can I replace the cheese listed with normal cheddar. I live in Korea and anything but cheddar is so expensive. Yes, cheddar would work great – I would probably reduce the amount of cheese by about a cup though since cheddar is a stronger flavored cheese!! thank you so much! going to make this tomorrow, I will let you know the consensus. Can’t wait to hear how the “taste off” goes – I hope you had a wonderful holiday! Savory bread puddings are pure heaven to me. Bread, cheese and herbs soaked in half & half then baked. Can’t get better than that! I couldn’t have said it better!!! Now you are talking! This is a stuffing I finally can sink my teeth into. YUM! Me too Cathy! But it’s addictive, so fair warning!! !